Food plays a key part of our travel plans, we love to eat great local food where ever we are travelling. When in the USA we seek out the happy hours, Sunday brunches, food markets, beer & wine festivals. Normally we stay in hotels, however this holiday we had booked villa accommodation, so we could enjoy cooking with local ingredients as well as dining out. Our first happy hour experience was off to a good start. We visited American Social in downtown Tampa, their craft beers were half price and shared plates $6. We ordered oysters, it would have been rude not to at a $1 each! AmSo is a great waterfront spot on Harbour Island, happy hour is 4-7pm Monday to Friday. It was the coconut crab fritters that attracted me to the Cuba Libre happy hour on I-Drive. This Cuban restaurant is situated at Pointe Orlando and quickly attracted some groups upon opening for happy hour. We sat by the bar and enjoyed a house cuba libre and guava caipirinha cocktail for $5 each. A basket of bread with an interesting butter arrived, shortly followed by our dishes of coconut crab fritters and pineapple guacamole cubano at $6 each. Service was excellent and the food fresh and extremely tasty. Happy hour is served 5-7pm everyday. Wow, Brunch at Cafe Tu Tu Tango on I-Drive, Orlando is going to be hard to beat. Their bottomless menu at $25 each together with bottomless mimosas & bloody mary’s at $15 each is the perfect way to start your Sunday in Florida. You need to book in advance, we were lucky, we arrived as they opened and secured 2 stools at the bar, others in the queue were turned away. 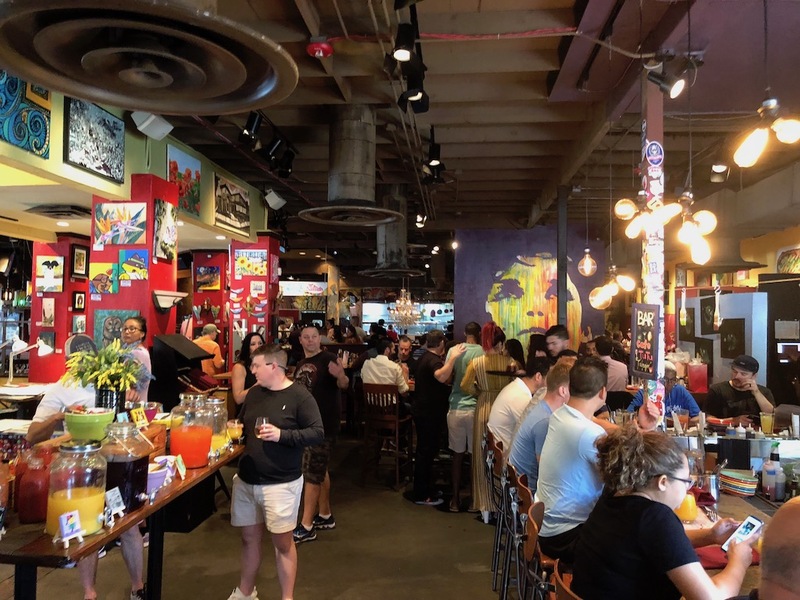 There’s a great vibe here, enjoy the taco & waffle stations as well as ordering any items from the brunch menu, they keep coming until you say stop. Wycliff California champagne was on free flow for the duration so we could personalise our mimosas, or the same with vodka if you preferred a bloody mary. Free valet parking available. Every Sunday there’s a farmer’s market on the shores of Lake Eola, downtown Orlando from 10-4. Parking opposite the venue for $5. There wasn’t a tourist in sight, this is a local’s market, there’s lots of interesting food stalls as well as arts and crafts. Families and friends were strolling along the pathways browsing the stalls or simply chilling out in the shade, listening to the live music.